The sunset of another NFL season is upon us with Super Bowl Sunday coming this Sunday, February 3rd. The matchup pins the New England Patriots vs the Los Angeles Rams from Mercedes-Benz Stadium in Atlanta, Georgia. The Patriots are looking to become the second franchise in NFL history to reach six Super Bowl titles, and amazingly, all six would have been won in the last twenty years under head coach Bill Belichick and quarterback Tom Brady. I have long been critical of the New England dynasty, be it mentioning the accusations of cheating, or the weakness of the division they play in or sometimes even some blind luck that has pushed them to the mountaintop. After this latest run, I really do not have much to stand on because the dominance of the organization, regardless of talent level on the roster, has never been paralleled in the history of the sport. New England is a staggering 29-10 in the postseason under Belichick, that is impossibly great and a trip to a ninth Super Bowl is simply even more impressive. However, the only leg I have to stand on is the record of Brady, Belichick and the Patriots in the “Big Game.” Obviously, this is finding criticism on an extreme relative scale because the number of Super Bowl appearances is simply remarkable. New England, as a franchise is 5-5 in the Super Bowl, with Brady and Belichick being 5-3 respectively. It would be interesting to see how the narrative would swing if the “Greatest Franchise in Sports History” were to lose on Sunday and drop their overall record to under .500 and also leave the Genius and the Tactician at 5-4, a mere one game over .500. 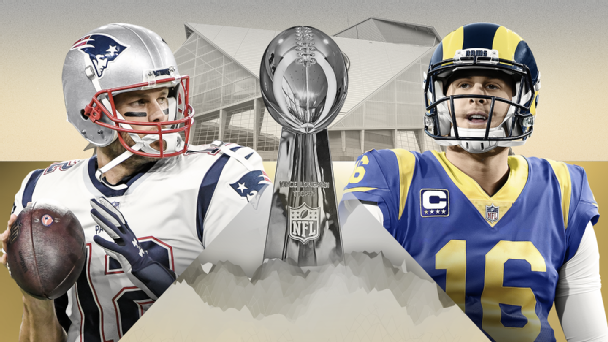 In all three Super Bowl losses for the Patriots, they have been the favored team (4.5 against Philadelphia, 2.5 against the Giants in 2012 and 12 against the Giants in 2008) and they enter this Super Bowl Sunday as 3 point favorites against the Los Angeles Rams. On the Los Angeles Rams side, they can feed off the energy of being the presumed underdog against the Patriots dynasty. If the Rams were to win on Sunday, head coach Sean McVay would become the youngest coach to ever win a Super Bowl. In 2002, these two teams met in the Super Bowl, although the Rams were in St. Louis at the time and Jared Goff, the Rams current quarterback was not even old enough to remember that game. Jared Goff is only 24 years old and he will be pinned against Tom Brady who sits at age 41. Ironically enough, the last Rams championship was in 2000 when they defeated the Tennessee Titans 23-16 and that game was also in Atlanta, but was played at the old Georgia Dome. Mercedes-Benz Stadium, the host of this years Super Bowl, was not opened until 2017, so this will be the first Super Bowl hosted in it, but the third for the city of Atlanta as a whole. Now, below I will predict how I believe the game will play out and I will also answer some of the more interesting prop bets that come along with the Super Bowl every season. The age old predicament of trying to choose between Brady and Belichick and an opposing team with an overall more talented roster strikes again. Seemingly every season, the Patriots find themselves back in the Super Bowl with, on paper, seems to be a roster filled with less star players than the opposition, except for the head coach and the quarterback. In the eight Super Bowls that Brady and Belichick have participated in thus far, all have been decided by eight points or less, win or lose. I think the Rams exploitable secondary will have trouble containing the intermediate passing game of the Patriots, meaning a heavy dosage of Julian Edelman, James White and Rex Burkhead out of the backfield that will keep New England ahead of the chains and the Rams will struggle to get off the field on third down. This is the most frustrating part of facing the Patriots is their ability to sustain long drives and just when a team thinks they have them pinned back, they seemingly always convert. I would guess that Belichick’s defense will sell out to try and stop the run in an attempt to minimize Todd Gurley and C.J. Anderson’s effectiveness and take his chances on Jared Goff beating them. I think Goff will find a few chunk plays against New England’s secondary be it with Robert Woods or former Patriot Brandin Cooks and this will ultimately keep the Rams in the game. However, I think in the end, the New England Patriots will be too much for Los Angeles and will take Super Bowl LIII by a final score of 30-20. This would be Brady and Belichick’s incomprehensible 6th Super Bowl ring and who knows how many more are still left to come. All we can hope for is an entertaining show on Super Bowl Sunday, so enjoy the game everyone. Enjoy Super Bowl Sunday everyone!